Water is a solvent. It pulls much of the flavor out of the meat, and it can make the meat mushy. When you boil meat and bones, you make a rich flavorful soup. All that color in the pot is flavor that you can never get back into the meat. Boil them too much and water can even dry them out by causing the proteins to contract and squeeze the moisture out of the muscle fibers. People talk wistfully about meat that falls off the bone, but if it does, it has probably been boiled and denuded of its best flavors. Usually all that remains is the unctuous barbecue sauce. That’s what they’re really lovin’. That’s why McRibs are so popular. They’re just ground pork swimming in sweetened ketchup. 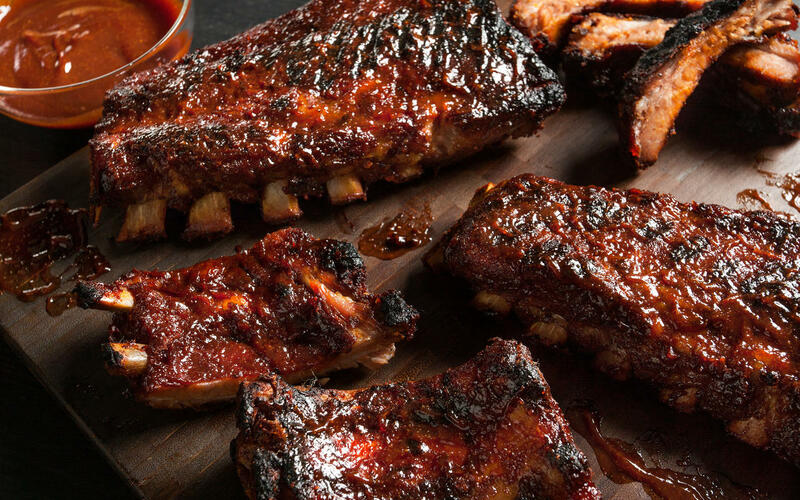 Classic Southern ribs have the same mouthfeel and bite as a tender juicy steak and most important, they taste like pork, not just sauce. They tug off the bone rather than fall off the bone. Looking for BBQ catering in NJ? Give Foodini’s a call! Take a look at our delicious BBQ menu, contact us by clicking here or simply give us a call at 732-775-3663. We can provide amazing barbecue food for your next social or corporate event.